Welcome to The Weather Machine at NecroBones.net! NOTE: My weather station is now offline, as of mid 2011, after running for nearly 8 years. Some components are failing, and I decided to discontinue. However, this page is remaining up so that the information is still available for people. 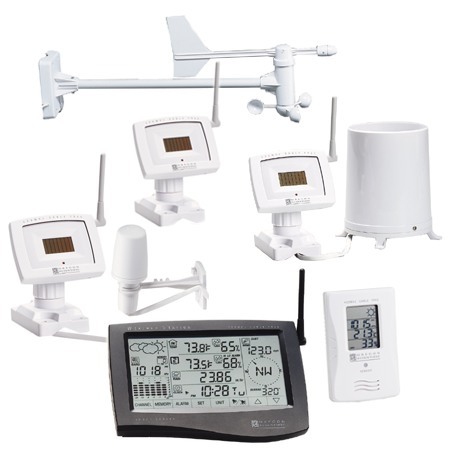 The Weather Machine is an Oregon Scientific WMR-968 weather station (these can be found for significantly cheaper than the suggested retail, if you look hard enough or get one off of eBay), which is a collection of wireless solar-powered (with battery backup) weather sensors. The receiver device consists of a wireless receiver, and a touch-screen LCD for displaying the weather information, and also a serial output port. With a basic straight-through serial cable, it can be connected to a computer for logging and analysis. This is where the Weather Machine scripts come in. These are a set of scripts for doing the logging and display of the collected weather information here on the website. If you're running a linux server and have a WMR-968 weather station, feel free to give my perl scripts a try. Information on Weather Station serial protocols.